Green Fire maintains and repairs all kinds of wood burning and multi fuel stoves – even if we didn’t originally supply them. 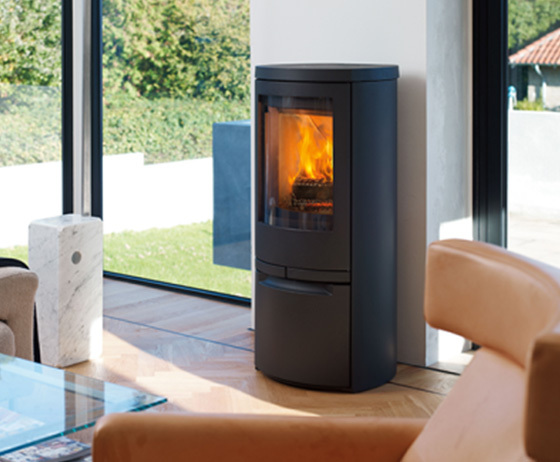 From year-old stoves which need their first annual maintenance work, to decade-old stoves which need a lot of work to bring them back to their initial, efficient selves – Green Fire does it all. Of course, the easiest and safest way to prevent problems with your stove is to have an annual maintenance visit. We at Green Fire can do this for you, for less than you might expect! Think about an annual stove service as an MOT. It will help you identify things you may have to watch out for in the future, but most importantly, it can find and fix small problems before they become larger issues. It’s the best way to guarantee that your stove won’t break down in the winter months – so give us a call today! We understand how it happens – a stove does its job well enough to worry about at another time, when suddenly… nothing. These things never happen at a good time, and within hours, your home is uncomfortably cold. You need a qualified and experienced stove technician – and quickly. Call Green Fire, and we’ll be there quickly, to help get your home back to the cosy, warm and welcoming place it once was. Our rates are competitive, and the work we do is guaranteed. Most of the repair work we do is done on the first visit – meaning you won’t have to wait too long before enjoying a warm home once more! On the rare occasions when we do need to re-visit, for instance if we need to order specialist parts or equipment, we’ll do everything we can to make sure the repair is done quickly. Wood burning stoves are a fantastic way to keep your home warm, as well as save money on energy bills and reduce your carbon footprint (as wood is a carbon neutral fuel). A wood burning stove can heat your entire home, not just the room it’s in. 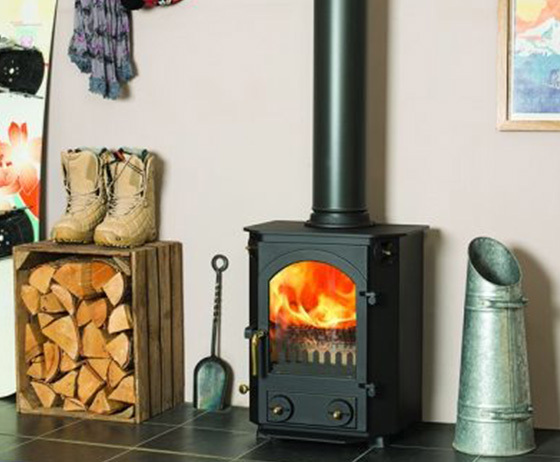 Even for small homes, wood burning stoves are a brilliant way to make your home feel more warm, welcoming. and expensive-looking. Multi-fuel stoves can burn not only wood, but also coal to heat your home. The ability to switch between fuels can be very useful, as keeping one or the other in storage can save you from going cold if one fuel type falls away: you can also take advantage of price fluctuations, purchasing the cheaper fuel and slashing your energy costs even further! To maintain efficient burning and safe use, your stove and chimney should be swept and serviced at least once per year. Green Fire can take care of this using a rotary power sweeping system as well as checking fire bricks, stove glass and rope seals to give you peace of mind when heating your home. The rotary power sweeping system is our preferred method where the rods are driven by a drill which rotates the head at high speed, resulting in a thorough clean. Some circumstances still require the brush and vac method, in which we also have years of experience. 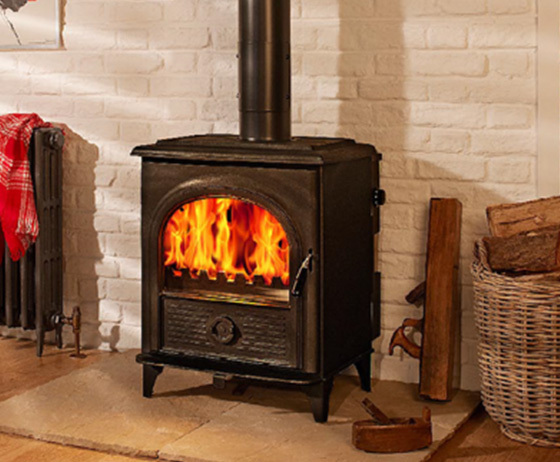 Green Fire provide quality chimney sweeping services for all types of stove & open fire. Many people consider chimney lining to be something they can do themselves. However, since April 2002, Building Control regulations adhere to work carried out on existing chimneys. Keep your home safe, legal and worry-free by hiring Green Fire to line your chimney. Fitting a Chimney Lining requires 2 fully trained installation experts. The chimney is swept first, to ensure that the work done will be as clean, tidy and safe as possible. After this is done, lining installation begins. One technician works from the roof, while the other works at the fireplace. Roof ladders and other safety equipment are used to meet the safety requirements necessary for working at height. Inside, the room is prepared with dust sheets and breathing apparatus to ensure the technician’s safety, as well as keep the room as tidy and clean as possible. 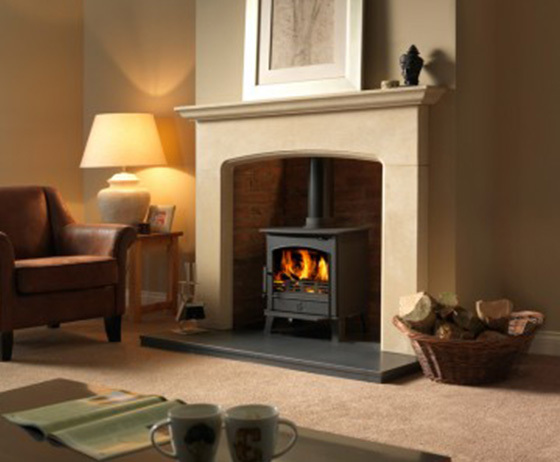 Green Fire provides wood and multi fuel burning stove sales and aftercare throughout the East Midlands.